In the first decade of the 21st century, the Horn of Africa became the global piracy hot spot, with headlines detailing multi-million dollar ransoms, rescue operations and violence. The international response to Somali-based piracy was organised into three domains: (i) maintaining order in international waters, (ii) reducing ships’ vulnerability, and (iii) development activities and institution building in Somalia. Since their introduction, pirate activity has dramatically reduced. The aim of our recent British Journal of Criminology paper How Super Controllers Prevent Crimes: Learning from Modern Maritime Piracy was to explore the suppression of Somali-based piracy from a criminological perspective. We adopted Routine Activity Theory to examine how the operating conditions of Somali-based piracy was altered. Routine Activity Theory (RAT) is beguilingly simple: the opportunities to commit crime are found through the routine activities of would-be offenders and victims. Many other theories of crime focus on root causes of criminality, such as poor upbringing, impulsivity, and so on. RAT instead focuses on the circumstances that bring together offenders and victims. Crime is said to be possible when offenders and victims are located in the same place, but can be prevented by the presence crime controllers, actors that regulate or influence the behaviour of offenders, victims and places. There is considerable evidence that the cause of crime problems is simply the result of crime controllers being absent or not doing their job. Consider the bar owner who continues to serve alcohol to intoxicated patrons. How can this person, who should be acting as a place manager, be persuaded to prevent crime rather than facilitate it? The answer is the super controller, an individual or agency with the means to install incentives for controllers to prevent crime. In this case an effective liquor licensing authority compels the bar owner to use responsible serving practices, under the threat of licence revocation. Applying this approach to Somali-based piracy, we argue that pre-2009 represented the perfect conditions for a crime harvest: an abundance of attractive and vulnerable targets in the form of merchant shipping, a ready supply of motivated and capable offenders, and no legitimate place manager (in territorial or international waters). Importantly, prior to 2009 no identifiable super controller for the High Risk Area existed. UN Security Council Resolution 1851 established the Contact Group on Piracy off the Coast of Somalia (CGPCS), a broad coalition of States, organisations and industry groups seeking to coordinate political, military and other entities to abolish piracy in the region. It consists of five Working Groups, each concentrating on a discrete dimension of the piracy problem in Somalia. The major initiatives introduced since the start of 2009 focus on different aspects of the problem. Place management was introduced through joint naval patrols of the newly established Internationally Recommended Transit Corridor (IRTC). Increased offender handling was implemented by establishing pirate courts and prosecuting pirates. Increased guardianship was brought about through the development use of ship protection measures (including armed guards) for vessels transiting the High Risk Area. Nine years (2006 to 2014) of pirate activity data (Anti-Shipping Activity Messages) collected by the US National Geospatial Intelligence Agency were used to test the impact of the three inventions. As the focus is on pirate activity on the high seas, incidents in ports were excluded from the analysis. We included both successful and attempted pirate attacks as this is a more valid indicator of pirate activity and the suppressive impact of the interventions. Our analysis estimated the impact of the introduction of increased place management, stronger criminal justice processes and effective ship protection on pirate activity in the High Risk Area. In addition, we included information on monsoon seasons and shipping traffic levels to rule out a number of competing explanations. The figure displays the results of the segmented regression model. The vertical grey lines indicate the commencement of the major initiatives. The model’s prediction for pirate activity is indicated by the solid red line (the dark gray ribbon surrounding this depicted the precision of these estimates — formally known as the confidence interval). The points show the observed pirate activity level. 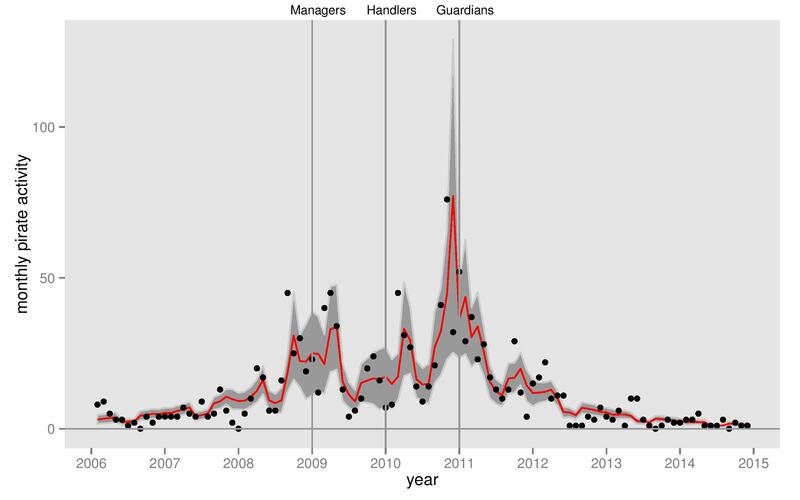 Our results suggest that naval patrols (place management) and ship protection (guardianship) had an impact on pirate activity based on the changes in trends immediately after their introduction. The response to the deployment of ship protection measures is particularly striking, returning piracy to levels not seen since before the rise. It is clear that the naval presence suppressed pirate activity around the IRTC but displaced activity across the Indian Ocean to waters beyond the reach of naval patrols. By contrast, protecting individual ships has (to date) had a continuing suppressive effect. We found no impact of pirate courts and prosecutions on pirate activity. These results raise a number of important implications for practitioners and researchers interested in preventing crime. Consider first the tangible differences between the two effective interventions. The naval patrols represent what policing scholars would call saturation patrolling, one of a suite of tactics used by law enforcement to create an image of intensive policing. Systematic reviews of drug law enforcement methods find that intensive policing operations had little impact on drug problems and spatial displacement is a natural consequence. The displacement, in turn, served to undermine the efficacy of the land-based initiatives as apprehension became logistically more difficult, clearly a key element of the land-based deterrence strategies. In contrast, ship protection measures provide protection throughout the High Risk Area, making spatial displacement much less likely. Shane, Jon. M. and Shannon Magnuson. 2014. 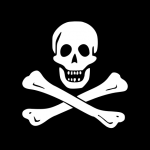 “Successful And Unsuccessful Pirate Attacks Worldwide: A Situational Analysis”. Justice Quarterly, 1–26. Shortland, Anja and Federico Varese. 2014. “The Protecor’s Choice: An Application of Protection Theory to Somali Piracy. British Journal of Criminology, 54(4): 741-764. Townsley, Michael, Benoit Leclerc and Peter H. Tatham. 2015. “How Super Controllers Prevent Crimes: Learning From Modern Maritime Piracy.” British Journal of Criminology: 1–21. Twyman-Ghoshal, Anamika. and Pierce, G. 2014. 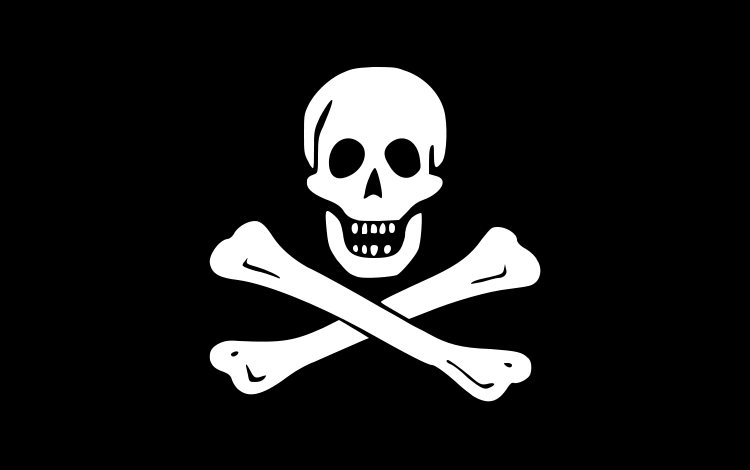 “The Changing Nature of Contemporary Maritime Piracy Results From the Contemporary Maritime Piracy Database 2001–10”, British Journal of Criminology: 54: 652–72. Associate Professor Michael Townsley is a senior lecturer at the School of Criminology and Criminal Justice, Griffith University, Brisbane, Australia. Prior to Griffith University, he held positions at the Jill Dando Institute of Crime Science at University College London, consulting for numerous Police Forces and local and central government agencies. His research interests include crime analysis (especially spatial and temporal dynamics) in conjunction with situational approaches to crime reduction. He has applied these techniques to a broad range of criminal activity, including burglary, vehicle crime, insurgent activity, maritime piracy and alcohol-related violence.